The Hepburn system is named after an American missionary who published a Japanese-to-English dictionary in 1886. The Kunrei system was adopted by government order in 1937. Hepburn is better at communicating to English speakers how a Japanese word is pronounced. Kunrei maps nicely to the Japanese syllabaries and is natural to Japanese speakers. Kunrei is documented as the ISO 3602 standard. 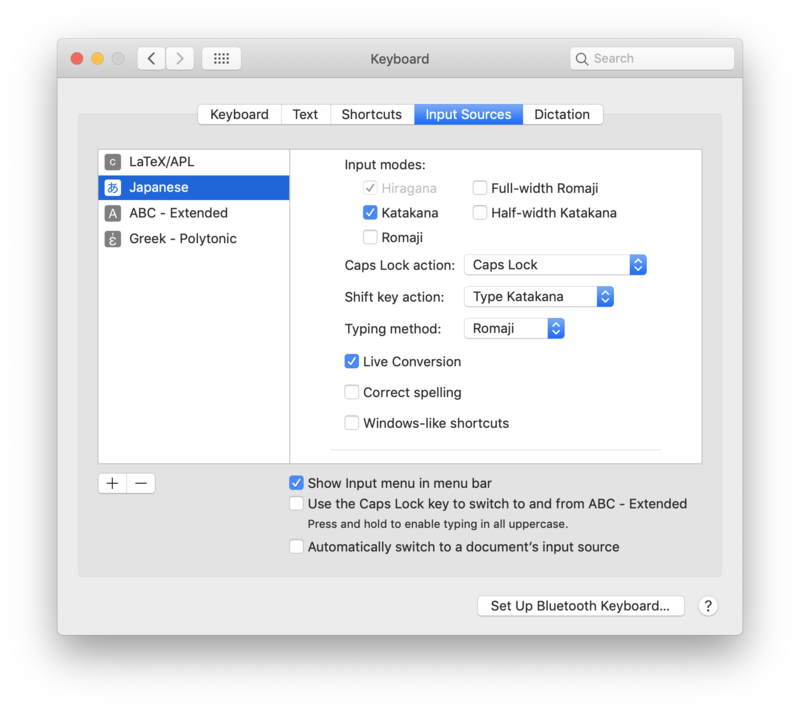 It make two input modes available: a hiragana mode and a katakana mode. The hiragana mode is used more often. In hiragana mode, I type using romaji and it is converted to hiragana. Because the live conversion feature is selected the text will sometimes be converted to kanji or katakana. I use the RETURN key to accept the conversion and the SPACE key to bring up a dropdown of alternate conversions. The dropdown may come up in any case. For romaji, one can use Kunrei or Hepburn spellings with exceptions. For long vowels, type the vowel twice, e.g. tyuugoku or chuugoku instead of tyūgoku or chûgoku. In Japanese, long e can be spelled either ee or ei even though they are pronounced the same. Similarly long o can be spelled either oo or ou. For the benefit of the input method you must use the correct spelling. In katakana long vowels are written with a dash and one must type a dash when using the input method. The particles は, へ, and を are pronounced wa, e, and o, although they are spelled as if they were pronounced ha, he, and wo. The spellings and not the pronunciations are used when inputting them. The を character is only used for the particle since the syllable wo doesn't occur in modern Japanese. Japanese writes geminate consonants by preceding them with a small っ or ッ. One can input these characters by typing xtu and in general one makes any character small by prefixing it with x. One can also inputt a geminate consonant by typing the consonant twice. One may encounter difficulties typing a syllabic n: ん, say because it precedes a vowel. One can type n twice to force a syllabic n.
ぢ and じ are pronounced the same and both are transcribed as zi in Kunrei. Similarly づ and ず are pronounced the same and transcribed as zu in Kunrei. ぢ and づ are the rarer versions. They are are used when a ち or つ mora is voiced due to rendaku. Type di or du to input them. Many Japanese punctuation characters resemble European punctuation and in fact they were borrowed from European languages in the 19th century. The Japanese punctuation characters have different Unicode characters, however, since they are full-width. There is also a full-width space character, but it is used sparingly. A common use is to indent the first line of a paragraph. Words are usually not separated by spaces. When foreign words are written in katakana, the interpunct ・may be used to separate words. In particular the interpunct is often used between a foreigner's first and last name. The use of the comma and period is similar to their use in English. Occasionally a question mark or exclamation mark will be used in the same manner as in English. Questions are usually terminated by the particle か and a period, however. Similarly an emphatic sentence is often terminated by the particle よ and a period. In furigana dictionaries, the headwords are written in kana. If the word is normally written with kanji, this spelling follows inside lenticular brackets. /u/ is pronounced with unrounded lips. /u/ and /i/ are devoiced (whispered) between unvoiced stops and fricatives. A Japanese word can be unaccented or have an accent on any of its moras. This is realized by a drop in pitch on the mora after the accented mora. An unaccented word sounds like a word accented on its last mora when pronounced in isolation. The accent of a compound word is not predictable from the accent of its constituents in general. Compounds ending in -gòro and -gùrai have the indicated accent locations, however.